I followed part of the map of the West End in Caroline Swash's recent guide book one morning last week and saw a variety of stained glass sites that were new to me. Three churches, glass panels on the street and one hotel that wouldn't let us in because of a function. It was a great way to spend the morning and good to recognise some of my favourite themes in the work we saw . All Saints Church, Margaret Street is a richly ornamented brick church by William Butterfield, built and decorated from 1850 until his death in 1900. Particularly good is the combination of different types of lavish decoration - mosaic inlay, painted ceiling and wall panels, tile panels and stained glass windows - working together to create a wonderful interior that has been recently restored. One reason why these elements work so well together is that the figures on the walls and windows are all the same size, scale and style. Both the tile panels and the figurative windows are the work of Alexander Gibbs following Butterfield's designs (for the tiles) and specific instructions (for the glass). Favourite themes emerged during this visit to the first church: model building carried by St. Peter in the tile panel above, and in the stained glass, geometric architectural detail - like building blocks - above the figures. 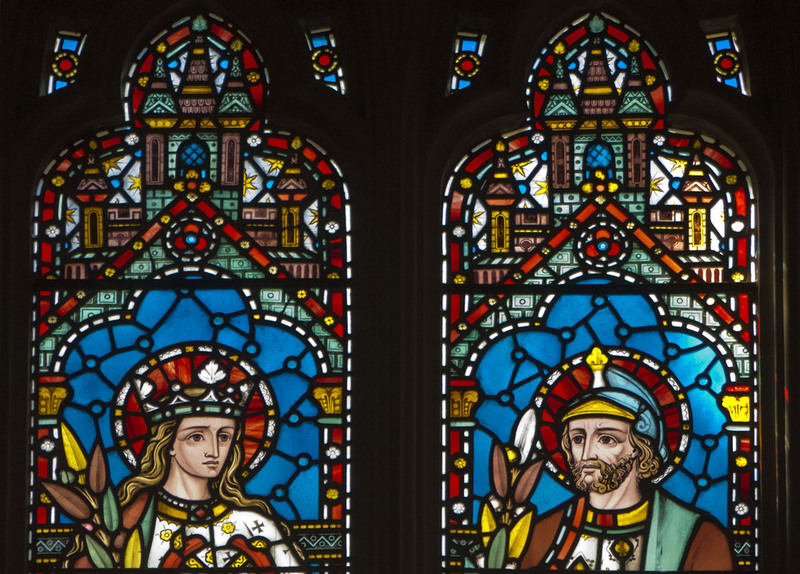 See details from the window of Saints Katherine and Alban below. The second church, St. Peter's Vere Street, is used as offices for the London Institute for Contemporary Christianity. It took a while to get into the building and then we were only allowed to view the window above the alter. All the other Burne-Jones/Morris windows are partly visible through secondary glazing with badly placed bars, office partitions, furniture and people at work (meaning no access). However, the Burne-Jones angels are beautifull in their pink robes, surrounded by a William Morris vine repeat pattern with tendrils and shaded leaves, a variation that I haven't seen before on another of my favourite themes. Then on to the street to see exterior glass panels, canopies and screens in new buildings, with whole blocks being rebuilt or refurbished. Alexander Beleschenko's panels in Princes Street (below left) were made in 2004, the workmen were there for another block going up next door. On the CBRE office building on the corner of Henrietta Place and Wimple Street (below right) there is a frieze of model buildings between the first floor windows, a great subject for a decorative scheme in this crowded part of town. Rushing now to get in and out before a service began, the last church was St. George's Hanover Square, notable for its 16th century Flemish stained glass that was remodelled to fit the windows here by Thomas Willement in the 1840s. However the glass that interested me, the walled city in brown & yellow (two favourite themes in one) is in the side chapel. In her book, Caroline Swash tells you its history and the reason why it looks so new - this is the kind of information I like and so rarely get! "In 1926 Sir Arthur's son Reginald Bloomfield made further alterations, adding a side chapel with glass by F.C. Eden. During the Second World War, this was blown out in the bombing of London and later replaced by a copy taken from Eden's original design."